SURF ALONG SOUTH FACING SHORES WILL BE 1 TO 3 FEET THROUGH FRIDAY. Read more about Don't jump! In 1955 Henry J. Kaiser constructed Hawai’i’s first visitor resort in Kalia at the west end of Waikiki. He dredged a swimming area and a lagoon out of the shallow reef fronting the property, and in 1956 lined them with imported sand, creating a new beach. In May 1958 the City Planning Commission voted to name the new beach Kahanamoku Beach in honor of Duke Paoa Kahanamoku (1890-1968), one of Hawaii’s most beloved sons. Kahanamoku spent much of his childhood in Kalia at his grandfather’s home, and it was here that he learned to swim, a skill that took him to four Olympic Games. In 1912 Kahanamoku won the gold medal in the 100-meter freestyle. He also swam in the 1920, 1924, and 1932 Olympics and remained an active supporter of all water sports until his death in 1968. 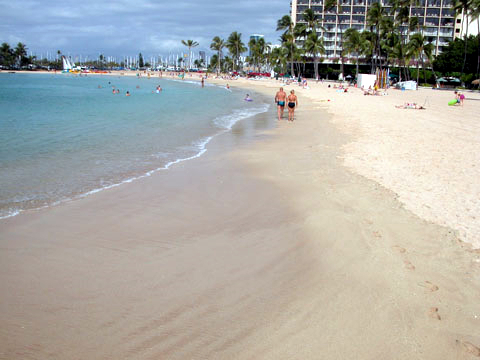 Kahanamoku Beach lies between the Ala Wai Small Boat Harbor to the west and the Hilton Hawaiian Village’s catamaran pier to the east. A shallow reef protects the beach and provides a popular swimming area for families with children. Kahanamoku Lagoon is adjacent to Kahanamoku Beach where its shallow sandy bottom slopes to a depth of fourteen feet at its center. Kaisers, one of Waikiki’s well-known surf sites, is on the west margin of the boat channel that passes through the reef.